A Global Strategy for Addressing Global Climate Change | Planet-TECH Associates: Trends. Innovations. Opportunities. 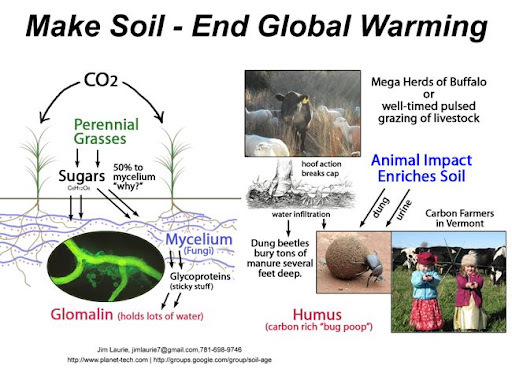 For the Earth's soils to once more sequester carbon as they formerly did it is essential to restore living soils with ever increasing organic matter and the abundant life forms that help produce it. Relatively small increases in soil organic matter amount to billions of tons of carbon stored safely and permanently over billions of acres of land. Conversely, relatively small decreases in soil organic matter result in vast amounts of carbon released to the atmosphere. It is the restoration of healthy soils that is biggest hope for immediate salvation because of the time it will now take to restore normal ecological functioning to our vast oceans and the relative ease of increasing soil cover and organic matter. An alternative to grassland burning and inevitable desertification first became apparent to me working as a young biologist/game ranger in Africa in the 1950s. Studying the damage experienced through government policy to burn Africa's grasslands I could not help but observe that the healthiest land was associated with remnant wild populations of large game animals. Where large populations of thousands of buffalo and other game, complete with packs of lions that followed closely and kept the herds bunched, the soil and vegetation was healthiest. What the wild, large concentrated herds did not consume, they trampled onto the ground, thus removing the old growth and preparing both plants and soils for new growth. The animals in intact communities were doing what we were using fire to do, but doing it better with no adverse effects of soil, wetlands, springs and rivers. The world’s vast savannas and grasslands developed over millions of years with soil, soil life, plants, grazing herbivores and their predators—all acting as one vast indivisible functioning whole in nature. The world’s large grazing animals tend to run in herds as a defense strategy against pack-hunting predators. The larger the number of animals, both prey and predator, the larger the herd masses. Such herding grazers have what are referred to as non-self-regulating populations. This means their numbers are only controlled by accident, disease or predation, rather than any innate breeding control. Because they cannot regulate their own numbers these populations were often enormous with numbers running to many millions. Today with far fewer numbers still, the same land is considered desert, despite no change in rainfall. The evidence appears strong that large numbers were the rule rather than the exception in the grasslands humans inherited. And yet to save these grasslands today, the common prescription is to reduce or remove the animals, especially livestock, so the grasses and soils can “recover” and then to burn the old material to keep the plants alive. In fact, only large herbivores, wild and domestic, can restore grasslands to their former health and productivity on the scale needed and with the speed required. They can replace the need for frequent burning, which pollutes the atmosphere and exposes soils, while enhancing the production of organic matter and maintaining soil cover. What’s more, they provide these services while also producing food and fiber for people. Since we generally aim to keep wild animals wild, the large herbivores most easily harnessed for this task are livestock. Under Holistic Management planned grazing they become tools for land reclamation, while also producing sustenance or a profit for those managing them. Today some 12 million hectares of rangeland are under holistic planned grazing in the U.S., Canada, Mexico, Africa and Australia mainly. Many are the people witnessing the reversal of desertification using greatly increased livestock numbers integrated with wildlife. While livestock are the only practical and readily available tool with which to reverse the degradation of the world’s rangelands to address this aspect of global climate change, we face an extraordinary situation of great confusion and danger. Powerful bureaucracies, such as the United Nations Food & Agriculture Organization (FAO), and major environmental organizations, ably assisted by the media, are today vilifying livestock, cattle in particular. Take, for example, the recently released FAO report that cattle are responsible for more greenhouse gases than automobiles. The report calls attention to how much methane cows produce, as well as the high amount of water required to produce a pound of beef or gallon of milk. It is these animals we need desperately to get out of pens and back onto rangelands and to increase dramatically if we are to restore rangelands to health and address global climate change to save our cities. What is consistently ignored is the fact that what is actually being condemned by the research is industrial agriculture with its factory model of animal production. Because mainstream institutional researchers and others are not distinguishing between animals in factory settings, overfed grains they did not evolve to eat, and animals grazing on ranges as they evolved to do, they are doing untold damage by causing unnecessary confusion. The world's enormous population, increasingly in cities, needs to be fed and healthy meat and milk will be required. To reverse desertification world wide will require many millions more cattle, goats, donkeys, sheep and camels than we have today. To illustrate this need for increased livestock to reverse desertification, which is counter intuitive, I am involved in assisting the Africa Centre for Holistic Management managing rangeland in Zimbabwe. On this land they are running 400% more livestock than it originally did. Through two recent serious droughts they have increased livestock further and the river that had gone dry in most years is once more flowing perennially in most years supporting a great increase in animal life. Both the retention of water and carbon, which follows a similar fate being linked to soil organic matter, have increased. Visiting range scientists from the Cape to Ethiopia are now benefitting from this case study example. It is counter-productive to quote numbers of cattle, assume ranges are overstocked and then condemn meat production. Take Texas as one example. The official USDA stocking rate for cattle in West Texas a hundred years ago today looks like science fiction. Travel any day through hundreds of miles of West Texas and you are likely to count less than 100 head of cattle in 300 miles. The ranges you will drive through exhibit mile after mile of dying grassland with generally over 80% bare soil between plants, and being severely invaded by woody plants. As you travel, you might pass one of the feedlot concentration areas conveniently positioned for cheap grain transport, and here you will smell before you see the hundreds of thousands of animals in pens being force fed grain as they are readied for slaughter.